To carry on from last time, Mary Anne and I left the Amsterdam Castle to continue our vacation. Because we had more time to sight-see since we were taking two days to travel to the Cape, Mary Anne said for me to find something that I wanted to see along the way. As I am a history, military and technology buff, this can be a little dangerous sometimes, leading us places like deep under a mountain for the infamous coal mine museum tour or some such. This time was not as dangerous, but it did have us exploring underground passages once again. 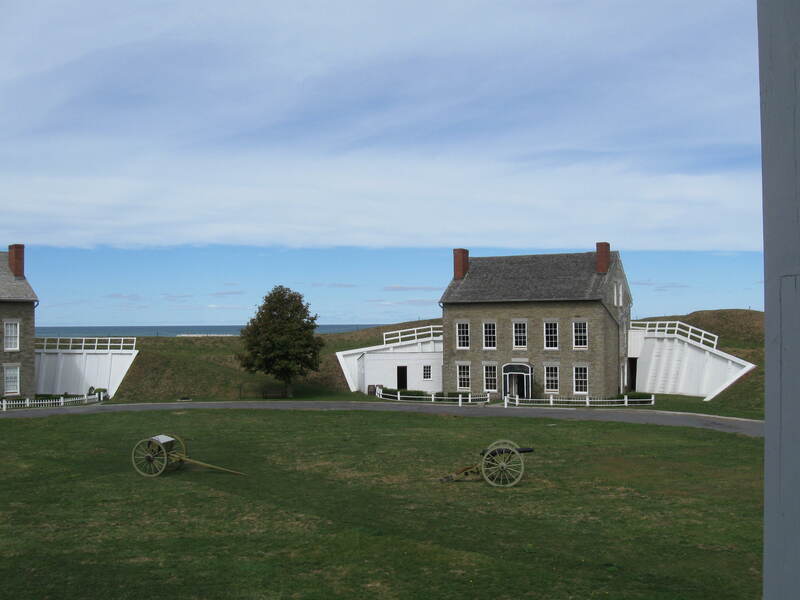 I picked a visit to Fort Ontario, which is in Oswego, New York, right on Lake Ontario (hence the moniker). Why was there a coastal fort built there? Coastal forts are usually located on the ocean shores, normally to defend important harbors and cities against enemy shipping. 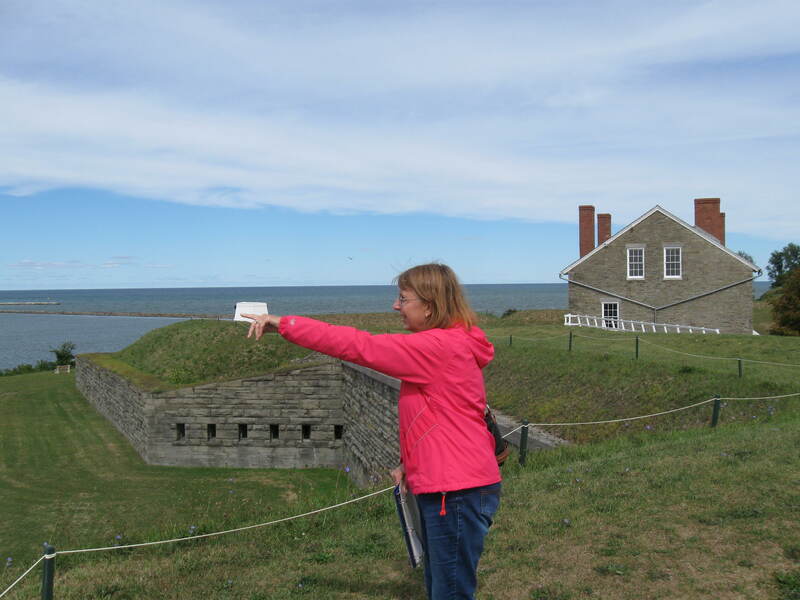 There weren’t even any big cities out here when the fort was constructed, this was the frontier, and the fort was there to guard the north end of the main travel route to from the eastern colonies to the interior. This was a water route (remember, no interstates back then) stretching from New York City, up the Hudson River, overland to the Oswego River and North to the Lake. From there all of the Great Lakes were open to travel to the interior. This was a potentially hostile border back then, remember that the French were in Canada. I was surprised by how much action the fort saw over the following years. 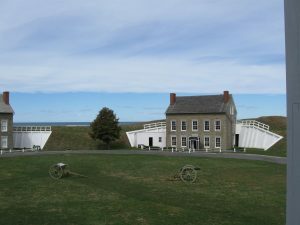 Fort Ontario is located at the mouth of the Oswego River and was originally built by the British in 1755 during the French and Indian war. The French took and destroyed the fort during that war, although the British rebuilt it in 1759. It saw action again during the American revolution, when the colonists took the ungarrisoned fort in 1778. The British returned and proceeded to hold the fort until the end of the revolution, when it was ceded to the United States as it was in U.S. Territory. 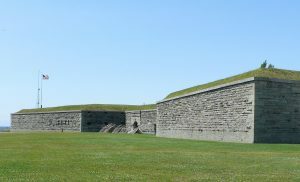 The fort was attacked by the British again during the War of 1812. They took it in 1814 and the U.S. had to rebuild it again after the peace treaty was signed. Construction continued sporadically until the American Civil War, when new defenses were added to the fort. Not to defend against the South, but for the possibility of renewed British hostilities via Canada. 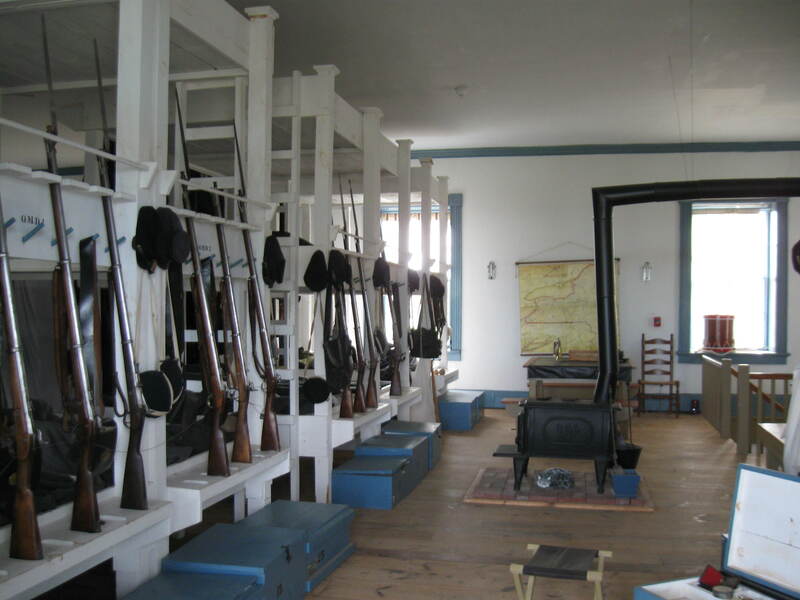 The fort was deactivated after the Civil War, but the post continued to be active as a gunnery school, military hospital and refugee center. When the post was finally closed, the fort was given to the state of New York to be opened as a state historic park. We both found the fort to be quite impressive. Architecturally it is kind of a mish-mash of different historical defensive eras. The earliest forts have all been destroyed and covered up, the earliest existing fortifications date from the early 1800’s. 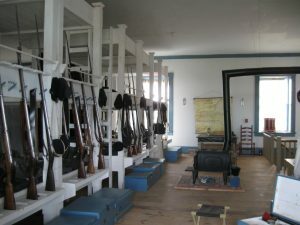 In this era the interior of forts was mostly open, with cannon mounted on either traversing barbette or field type wheeled mounts. 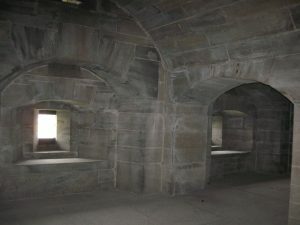 Landward defense was handled by a dry moat with the walls covered by flanking fire supplied by howitzers and riflemen protected in underground galleries. The remains of the fort are preserved in very good condition, with the interrier buildings restored to their period furnishings or filled with relics and displays relating to the fort’s history. There were a couple of volunteers dressed in period costumes to answer any questions. 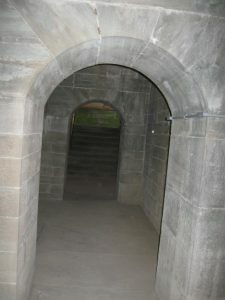 Undoubtedly the coolest part of the fort were the underground galleries that protected the men during attacks. 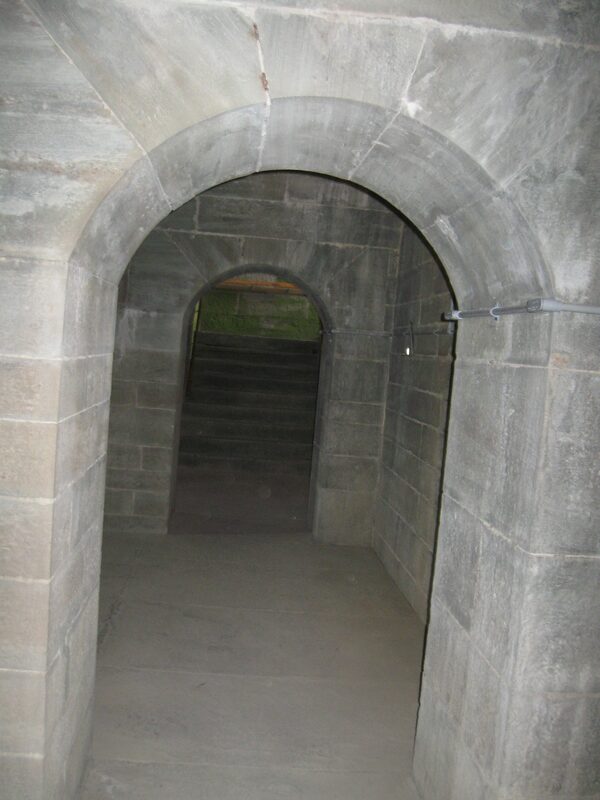 You had to go down about two flights of stone steps (you’ve got your flashlight don’t you?) and then you came out in a maze of rooms and tunnels. They were all constructed of carefully fitted stone blocks that provided the walls, ceilings, doorways, loopholes and cannon ports that were needed. Looking at all the work that went into a fort like this, you can see why they took years to build, and were sometimes never finished.